To help you get organized this year, we first brought you our favorite office space inspirations. Now we have the desktop accessories to take you rest of the way. From scissors to staplers to pens and calculators, we've got all your desktop accessories covered in modern fashion. 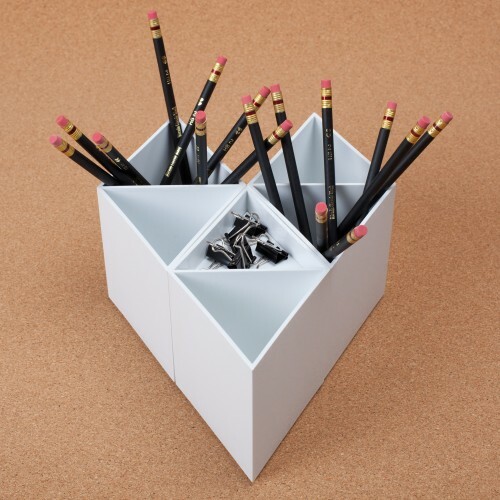 AMAC’s Rhombin set is an attractive way to organize your desk space while making a graphic statement. Offering modular storage for desktop items like pens and pencils, paperclips, and tape, this set of three Rhombins can be arranged in different configurations to suit your space. Sleek and minimal, this Magnetic Tape Cutter from designer Kamoi Kakoshi for MT Masking Tape adds beauty to functional office objects. A two-tone camel and cream coloring lends sophistication while the magnetized side adds unique functionality. Michael Sodeau designed the award-winning, ANYTHING Scissors, with simple functionality in mind. Each pair stands upright on a plastic rounded base making them readily available for use and freeing up valuable desk space. Designed in collaboration with Michael Sodeau and the Japanese production company Suikosha Corporation, the award winning ANYTHING Stapler was created with simple functionality in mind. Its rounded lines make it easy to hold with a stapling action that is both strong and fluid. Designed to be put away horizontally freeing up valuable desk space. When it originally debuted in 1987, Braun’s iconic ET66 helped elevate the calculator to an everyday personal item. Its sleek styling, slim plastic casing and approachable interface were the masterstroke of influential German designer Dieter Rams and his partner at Braun, Dietrich Lubs. Here the ET66 eight-digit calculator is faithfully reproduced, down to the inviting round buttons and high-contrast palette of its number and function buttons. Convenience and functionality blend into elegant design with Coalesse’s PowerPod. Designed by Scott Wilson and MINIMAL, PowerPod delivers two functions in one. When needed, the PowerPod houses six power outlets with built-in surge-suppression. When not needed, the outlet is converted to a sleek pencil organizer and accessory tray. Energy-saving on/off switch reduces vampire power consumption. These pencil sharpeners are made by DUX, the oldest German brand for high quality pencil sharpeners, established in 1908 and continuing production in Geretsried, Bavaria. Made from blocks of Duroplast (Bakelite). Duroplast was the material used to produce the body of the Trabant peoples car, manufactured in East Germany until the fall of the Berlin Wall. Keeping on task need not be drudgery with the cheery Fabric Bound Planner by J. Han for Paperways. Open-dated for customizable entry, the smartly-designed interior pages feature yellow and white page stripes to keep you on track and extra graph, lined and blank pages to jot down notes, lists and any other essential information.